All dogs are cute, but if there was one that we would give a Cuteness Award to, it would have to be the Pug. Their small stature, smooshed faces, and wrinkly bodies are just too adorable to handle. Add to that their intelligent nature, playful disposition, and unending affection and it’s no wonder why Pugs are one of the most beloved breeds of all. They’re also super easy to care for. The only grooming products they require are a high quality dog shampoo, a dog brush, a good pair of nail clippers for dogs, and dental hygiene items, like toothbrushes for dogs and toothpaste for dogs. This breed also only requires moderate amounts of exercise, so taking this furry pal on a daily walk with a properly fitted dog collar or dog harness should suffice. And, you’ll also want to have a nice supply of interactive dog toys to keep your pug entertained because they really do enjoy playing, as well as a supportive dog bed where he can enjoy restful slumbers and a dog crate if you’re potty training or leaving him home alone for a while. But, other than these requirements, Pugs really are easy to care for. Of course, you want to make sure that your Pug is getting the best care possible. That’s why you make sure you select the best products for him; and there’s one product that you really don’t want to slouch on: your Pug’s dog food. This breed tends to have a ferocious appetite and will eat more than they should, if they’re allowed to, which can lead to excessive weight gain. Additionally, they are prone to certain health conditions. According to veterinarians and animal nutritionists, feeding your Pug a premium-quality food that meets his nutritional needs can help to offset health issues. But with so many different dog food brands on the market, how do you know what to choose? We’ve conducted a tremendous amount of research and have concluded that the following five options are the best dog food for Pugs. Now that you’ve had a look at our top five picks of the best dog food for Pugs, let’s take a closer look at each option. Below, we offer a more in-depth description of each Pug food, including an overview of the ingredients, why each one is considered a great choice for Pugs, what we like about them, and what other parents of Pugs have had to say about them. Once you are finished reading through the reviews and decide which pug food you think will best meet the nutritional needs of your pooch, click on the buttons to find the best prices currently available on Chewy and Amazon. First up on our list of the best dog food for pugs is Royal Canin’s Breed Health Nutrition Pug Adult Dry Dog Food. Pet parents of all breeds of all breeds have been feeding their four-legged family members Royal Canin dog food for decades. That’s because this manufacturer uses the highest quality ingredients and creates a variety of formulas to suit the nutritional needs of all types of dogs. This formula is made specifically for adult pugs. It offers the complete balanced nutrition that your furry pal needs in order to ensure that he is getting the essential vitamins, minerals, and nutrients that he needs to maintain a healthy lifestyle and a healthy weight. The first ingredient in this recipe is chicken meal, which provides a healthy dose of protein. Protein helps to promote the development of lean muscle mass. It also helps to keep those joints healthy and can help stave off hip and elbow dysplasia, conditions that pugs are prone to. Other ingredients include brown rice and oatmeal for easy digestion. The infusion off essential nutrients, such as folic acid, zinc, glucosamine, vitamin E, and omega 3 fatty acids help to promote skin, coat, and digestive health; the formula also strengthens the immune system. 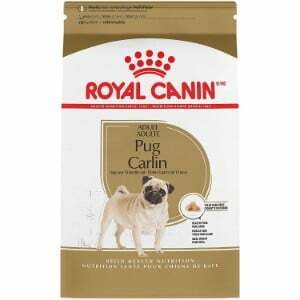 Additionally, the kibble featured in this Royal Canin food is engineered specifically for the short, flat muzzles of pugs, making it easier for them to pick up and chew, thereby improving dental health, too. Based on the reviews that we read, most pet parents are very happy with this adult dry dog food for pugs. They say that their furry friends love the taste and have no problems grasping and chewing it. However, do be advised that it does contain gluten-based products, so it may not be suitable for pugs that are sensitive to corn, wheat, or soy. Final Verdict: Royal Canin Breed Health Nutrition Pug Adult Dry Dog Food is specially formulated for adult pugs. Not only does it meet their nutritional needs, but it’s also easy for them to pick up and grasp, making this an excellent meal choice for your pooch. If your pug is sensitive to corn, wheat, or soy, or you just don’t want to feed him this ingredients, a grain free dog food is the way to go. Blue Buffalo dog food is famous making grain free formulas for all types of dogs, and for using the best possible ingredients in their recipes. Their Life Protection Formula Natural Adult Small Breed Dry Dog Food will suit the dietary requirements of your pug, as it is made specifically for small breed adult dogs. Like all Blue Buffalo recipes, the first ingredient featured in this formula is real meat, which, in this formula is sourced from premium quality chicken that has been carefully deboned. Chicken is a great source of protein and it will help to build and maintain your pug’s lean muscle mass. Other wholesome ingredients include whole grains that are easy to digest, such as brown rice, oatmeal, and barley. There’s also a wealth of fresh fruits and veggies featured in this kibble, like cranberries, blueberries, peas, potatoes, and sweet potatoes; all ingredients that are easy to digest and provide a wealth of essential nutrients. The inclusion of Blue’s Life Source Bits, which contain a proprietary blend of antioxidants, vitamins, and minerals, will further support your pug’s overall health. And of course, there are absolutely no grains used in this formula; nor are there any artificial flavors, preservatives, or fillers. It’s a natural food that serves up wholesome goodness. Pet parents seem to be very pleased with this recipe, as most report that their small breed adult dogs (including pugs) love the taste and that they notice a marked difference in their health. 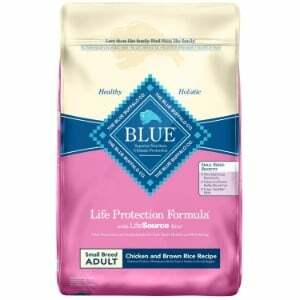 Final Verdict: Overall, we are very impressed with Blue Buffalo Life Protection Formula Natural Adult Small Breed Dry Dog Food. It offers the balanced nutrition that pugs need, is grain free, and helps to promote the overall health of these small breed dogs. Pet parents have raved about Hill’s Science Diet dog food for decades. That’s because this manufacturer relies on the input of a team of animal nutritionists and veterinarians to ensure that the food they are making meets the dietary needs of canines. Their Small and Toy Breed Dry Dog Food is a great option for pugs. It’s nutritionally balanced for toy and small breed canines, and since pugs are classified as a small breed, it certainly will meet your little guy’s needs. This recipe is precisely blended for small dogs. It contains premium quality proteins and calcium to support lean muscle mass and strong joints and bones. The infusion of antioxidants and vitamins C and E help to strengthen the immune system. The addition of vitamin E and omega 6 fatty acids promote healthy skin and a shiny coat. Ingredients include cracked pearled barley, whole grain wheat, spinach, tomato pomace, oat fiber, an carrots, so you know that your pet will be eating wholesome goodness. Customers seem to be very pleased with this dog food, as is indicated by the wealth of positive reviews that we read. However, do be aware that it contains wheat and soybean oil, so if your pooch is sensitive to gluten, keep that in mind. 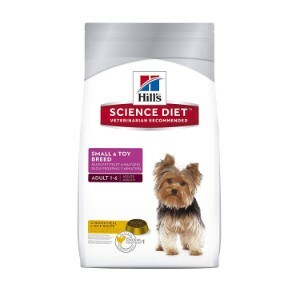 Final Verdict: For a high quality dog food for your pug, Hill’s Science Diet Small and Toy Breed Dry Dog Food is a great choice. It’s easy for small dogs to chew and contains the essential nutrients that they need to maintain their overall health. 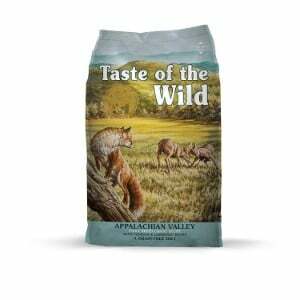 Taste of the Wild dog food is another brand that pet parents rave about. This manufacturer only uses the highest quality ingredients to create formulas that mimic the diets that ancestral canines ate. If your pooch needs a grain free, high protein dog food, then this is an excellent option to consider. The first ingredient featured in this recipe is real venison, so it has a high amino acid profile. Amino acids are crucial for all dogs, but particularly for pugs, as it is the building block of healthy bones and joints; since pugs are predisposed to joint issues, feeding your pet this food can help to prevent these types of problems. This recipe also contains a blend of fruits, vegetables, and superfoods to ensure that your pup is getting the essential nutrients that he needs, such as antioxidants, fatty acids, and a variety of crucial vitamins and minerals. Since it is grain free and contains a proprietary blend of probiotics, it is easy to digest, making this a great dog food for sensitive stomachs. It’s also completely free of artificial colors, flavors, and preservatives. In other words, your pug will be getting all of the wholesome goodness that he needs and none of the harsh additives that he doesn’t. Taste of the Wild is made in the USA and is a family-owned and operated company that adheres to the strict quality assurance standards and guidelines for animal food safety. Final Verdict: For a premium quality food that you can count on to nourish your pug, Taste of the Wild Grain Free High Protein Dry Dog Food Appalachian Valley Small Breed is definitely worth considering. It offers the complete, balanced nutrition that your pug needs to thrive. 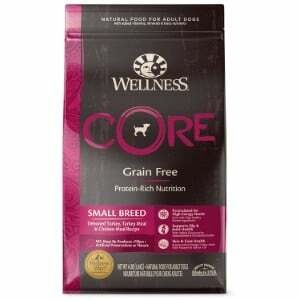 Last, but by no means, least on our list of the best dog food for pugs is Wellness Core Natural Grain Free Dry Dog Food Small Breed. Wellness dog food is yet another very reputable name that you can count on to meet the nutritional needs of your furry friend. This is another grain free option, so if you are looking for a dog food for allergies because your pug is sensitive to corn, soy, wheat, or other gluten-based products, this formula will help to prevent irritations. It’s also rich in protein, which is important for pugs, as they are prone to joint issues, and protein helps to build strong muscles, joints, and bones, thereby preventing joint health problems. The first three ingredients in this recipe include deboned turkey, turkey meal, and chicken meal , so it’s definitely safe to say that it serves up a healthy dose of protein. Other ingredients include easy to digest carbohydrates, like white potatoes, peas, and flaxseed. It’s also infused with essential vitamins and minerals, like beta-carotene, niacin, vitamin A, and taurine. Ingredients like sweet potatoes, kale, broccoli, apples, blueberries, parsley, and carrots further enhance the nutritional profile and make the taste very palatable. Pet parents seem to be very pleased with this dog food, and our panel of experts agrees that it is a leading dog food for pugs. Final Verdict: If you’re looking for a premium quality dog food for your pug, you won’t be disappointed with Wellness Core Natural Grain Free Dry Dog Food Small Breed. This recipe offers the balanced nutrition that small breeds, like pugs, need to thrive. If you want your furry friend to live a long, healthy, and happy life (and of course, you do), then it is absolutely crucial that you are feeding him a premium quality food that will meet his unique nutritional needs. By offering him only the best food, you can ensure that he is getting the balanced nutrition that he requires to thrive. Plus, you can help to prevent certain health conditions that pugs are prone to. Pugs are beloved for their playful nature, their sweet dispositions, their intelligence, their affection, and their loyalty. However, they are also known to have huge appetites and have a genetic predisposition to certain health conditions. All breeds require protein, but pugs do require a bit more than other breeds. That’s because they can develop joint issues, like hip and elbow dysplasia, and since protein helps to strengthen the muscles, bones, and joints, it can help to prevent the development of joint problems. Crude fats. This nutrient provides pugs the energy that they need, which is important, since they are such energetic dogs. Since crude fats burn slowly, they also help your pug stay fuller longer, therefore, they can prevent overeating. Complex carbohydrates. Like crude fats, complex carbohydrates also fuel your pug’s energy levels. They also burn slower than simple carbohydrates, so your pooch will stay fuller longer, and therefore will be less inclined to over-indulge. Fatty acids. Pugs are prone to skin and coat issues. Their skin tends to become dry, which then makes their hair dry, brittle, and leads to increased shedding. Fatty acids nourish the skin and coat. A premium quality dog food for pugs will contain all of these essential nutrients. Each of the options listed in our review meet the nutritional needs of the pug breed, thereby helping to ensure that their overall health and well-being is in good standing. By feeding your pet a premium quality food that meets his dietary needs, you can help to prevent the development of these health problems so that he can live a long, happy, and healthy life. If you have a pug, you are definitely going to want to make sure that you are feeding him a diet that is rich in the vital nutrients that he needs to thrive. In doing so, you can help to promote a healthier and happier life so that you and your furry best friend can enjoy plenty of years together. All of the food options that are listed in our review have been assessed and tested by a panel of animal nutritionists and veterinarians. They are made with premium ingredients and are precisely balanced to ensure that a pug’s dietary requirements are being met. Whichever option you choose, you can have peace of mind knowing that your pug will be getting the best nutrition possible.